BANANAS is the "appeeling" comedy show for the whole family! 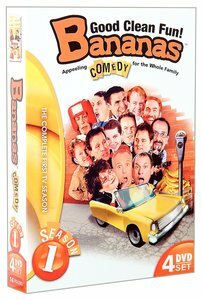 BANANAS TV SEASON 1 contains more than 10 hours of comedy on 4 hilarious DVDs. This impressive collection of talent goes beyond stand-up comedy to include ventriloquists, musicians, songwriters, actors, playwrights and more. With accolades too numerous to count, many of the comedians have made appearances on Comedy Central, PAX, Showtime, VH-1 and the Late Show with David Letterman, and have worked with stars such as Jerry Seinfeld, Carrot Top and Rodney Dangerfield. About "Bananas Tv Season 1 (4 Dvd Pack)"